Twitter DM stands for Twitter direct message. It's a private message sent to a specific person on Twitter. You can only send DM messages to your Twitter followers, the people who follow you. Like tweets, they can only be 280 characters long. Where Does a Twitter DM Message Show Up? A Twitter DM appears on the personalized Direct Messages page of both the sender and the receiver of the DM. It does NOT appear in the public Twitter timeline of tweets that everyone can see; nor does it appear in the private timelines of tweets that the recipient sees or the receiver sees. A Twitter DM is not the same thing as a tweet. It appears only on the sender’s and recipient’s private Direct Messages pages. That makes these DM messages somewhat analogous to the private messages that people send to each other's Facebook inboxes. They're threaded, too, so you can click a little blue pin to the left of a DM on your Direct Messages page and see the dialogue you had back and forth with someone using Twitter's direct or private communication system. You can mouse over any particular DM you sent or received and see a little trash can icon next to it, for deletion. If either the sender or receiver clicks that icon and deletes a DM from their private inbox, it will disappear from BOTH of their inboxes. DM's are a little like instant messaging because the messages are sent instantly to the other user. But one difference is that the recipient doesn't get a ping or have anything flashed at them to while they're signed into to Twitter to say "Hey, you just got a Direct Message!" The main way they get alerted is if they have an email alert turned on in their Twitter settings, inviting Twitter to send them ​an email every time they get a DM. So basically, people have to check their Direct Messages inbox, and not everyone on Twitter does that with great regularity. Click on the name or picture of the sender to bring up your DM page and read the message. To reply to a DM, just compose your message in the handy box at the bottom of the DM. Then click Send. To compose a Twitter DM, you go to your DM page and click the New Message button. Then type your text in the box that opens up and click Send message. You can also send a direct message using the regular tweet box. You just use a special code to mark it as a DM so it will be private and not be sent into any tweet timelines. The code is to start your tweet with the abbreviation, D, then a space, followed by the @username of the person to whom you're sending a private communication. the @username of the person to whom you're sending a private communication. BUT of course there's one problem with that DM-- Lady Gaga wouldn't see your message unless she was following you! 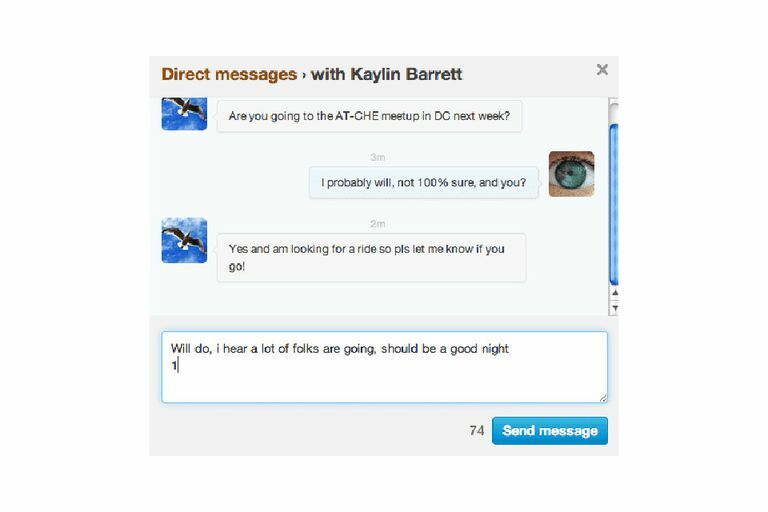 Remember, you can only send Twitter DM messages to your followers, no one else. Another potential problem with DMs that you create with the regular tweet box is the potential for a typo which can inadvertently send your private message to your public tweet timeline. If you type another letter instead of "d," for example, or you forget the space afterward or make another typo at the beginning, then that supposedly private message can wind up in the public timeline of tweets. Lots of celebrities have made this mistake and learned the hard way about DM's that go public. It's hard to keep all the Twitter language and message codes straight. Consider the high-profile Anthony Weiner Twitter mistake, in which the then-Congressman sent a lewd picture of himself to a Seattle woman via a Twitter message which he later claimed was meant to be private. But instead of starting it with the "d" for direct, private message, Weiner started it with @herusername, which sent the tweet into his own tweet timeline. Eventually, of course, he resigned from Congress over the tweeting scandal. Why Send a Twitter DM? You might wonder why people bother sending a Twitter DM rather than a private email or a public tweet like, for example, a Twitter @reply. Well, perhaps you don't know the email address of your follower, or maybe you can't be bothered to look it up. Also, if you're active on Twitter, it may simply be more convenient to type D and the @username of your pal and fire off a quick message. Other people like to send a Twitter DM to every new follower they get, with a welcoming message.